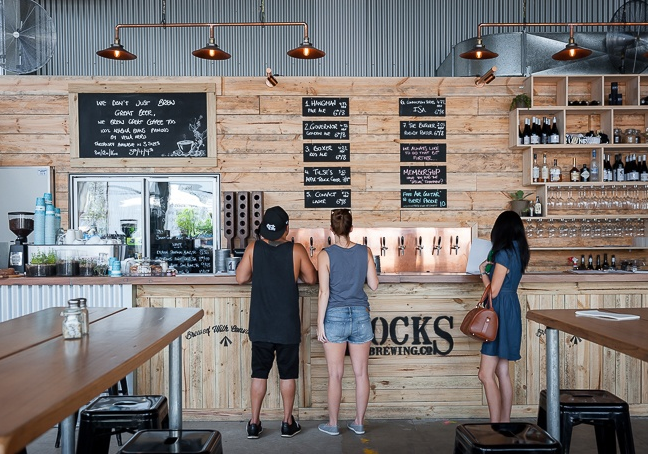 After outgrowing its former home base at Harts Pub in the city, Rocks Brewing Company has moved to a shiny new brewery in Sydney Corporate Park in Alexandria, and there is a spanking new bar attached to the brewery where you can settle in and sip all its tasty ales. The bar sits at one end of the cavernous new brewery, affording you views of the shiny metal vats and making it possible for you to watch your beer being made. The decor is made up of concrete floors, black metal chairs, industrial lamps and dark timber tables. A spacious outdoor area spills out into the building’s forecourt, and despite being in an office park, it’s rather pleasant, with a scattering of old trees successfully nullifying the bland, corporate aesthetic. At the bar, all of Rocks Brewing Company’s hits are tapped. Choose from the Hangman Pale Ale, the Governor Golden Ale, Boxer Red Ale, Convict Lager, and even the Conviction Series One Shot Caffeine Red Ale. Beer comes in a pint or half pint, or you can get a tasting paddle with dainty little glasses of all five ales. When all that beer gets to you, snack on onion rings with BBQ sauce, chargrilled chorizo with romesco sauce or marinated lamb skewers. Heartier fare includes grain-fed striploin, a pulled-pork burger and a beer-battered barramundi burger. Rocks Brewing Company does coffee throughout the day (Vella Nero), and breakfast on the weekends (but you’ll have to wait until 10am for a beer). The good news keeps coming for fans of Rocks Brewing: it has taken up the lease of the old Lord Raglan pub in Redfern and is in the process of refurbishing it. They’re planning a friendly neighbourhood local with plenty of craft beer and hearty eats.